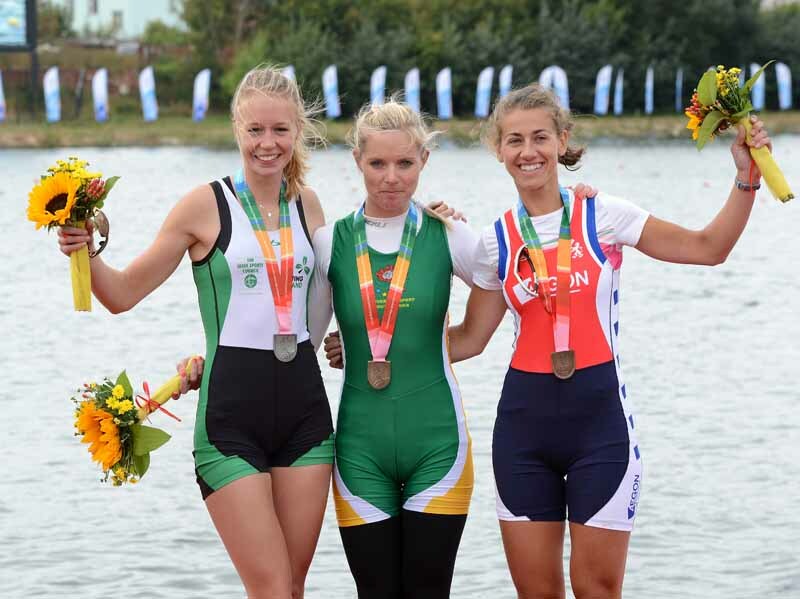 Claire Lambe, Kirsten McCann and Nielke Elise Van Hoogenhuijze, medallists in the lightweight women’s single sculls at the 2012 World University Rowing Championships, Kazan, RUS. 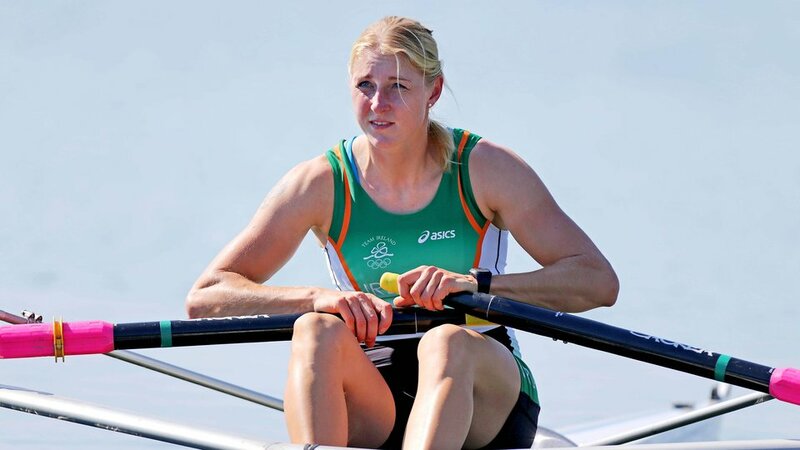 We were delighted to hear of Claire Lambe’s success in the World Univestiy Rowing Championships, where she placed second behind Kirsten McCann. The Rowing Development Fund was in a position to make a donation to Claire to support her participation in the event, and Old Collegians wishes her in her final year of Mechanical Engineering, as well of course in whatever rowing brings her over the coming months and years. Old Collegians Boat Club is happy to offer those travelling to Ireland for the Dublin Web Summit the opportunity to get out for an early morning spin in a eight on the river Liffey. This offer is open to all attendees of the Dublin Web Summit, the only stipulation is that you must have at least one year’s experience of rowing. Who knows, we may even be able to convince the Web Summit’s Marketing & Events Consultant Niall O’Toole to come out for a spin. Niall is a former Sculling World Champion and Olympic finalist, and knows this stretch of river like to back of his hand. Seamus McHugh joined UCDBC in 1962 during the brilliant Captaincy of Austin Carty. Recruitment have been so successful that four UCD maiden VIIIs travelled to Belfast in December for a Queen’s at home in a bus driven by John Gallivan, who had a dreadful time trying to control us when the bus was stopped at 2.00 am on the way home by “B” Specials. Later in the month Seamus McHugh and Tom Kirby won the Butler Cup with some distance to spare in a large and competitive competition. Seamus was a primary school teacher and had become the principal of a Primary School at the age of 19. He was then studying Arts at UCD to become a secondary teacher. He was the youngest of 10 children and had grown up in the townland of Muckross in the Glenties in West Donegal and never lost his unusually soft and musical Donegal accent. Austin continued his great work by having 3 VIIIs in the second term. In those days the Porter’s lodge was on the left of the entrance at Earlsfort Terrace and the UCDBC Notice Board just beside it in the most prominent position of all club notice boards. We eagerly awaited to find out whether we were rowing with the Flippers, the Flappers or the Floppers. As there were lectures on a Saturday morning rowing took place in the afternoon, and similarly on Sunday as everybody went to Mass in the morning, there being no evening masses at that time. By Summer we were down to two Eights and out of them one of the best ever Maiden iVs that rowed for UCDBC emerged. Seamus McHugh at Bow, Tom Kirby at 2, Kevin Reade at 3 and stroked by Dave Buckley. Seamus was 27, Tom was 20, as I think was Kevin Reade and Dave Buckley was in his final year engineering. None had ever rowed before and none were particularly “sporty”. It would be 8 years before there would be s similarly mature Maiden Crew that would be later named the Animals. 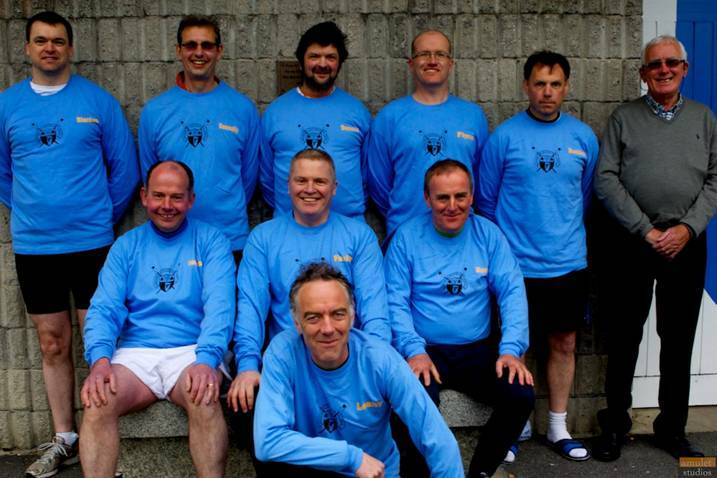 The IV went Cork Cappoquin and Fermoy, driven by Seamus in VW Beetle and came back victorious with a clean sweep of 3 wins. It went on to win another three races at Carlow, Athlone and Waterford. 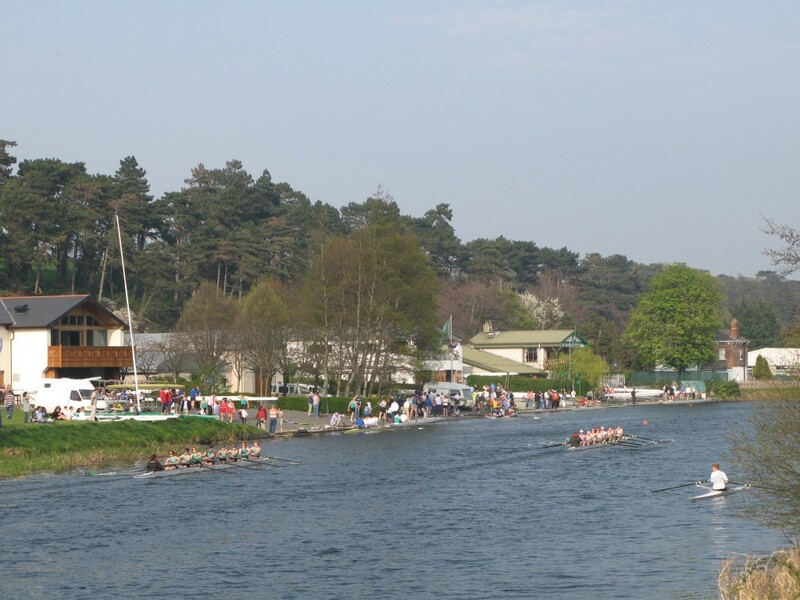 At Carlow they were so far ahead in the final that they stopped rowing well before the finish and glided in with perfect balance to the sound of a stirring Brass Band amidst glorious sunshine and cheering spectators who had attended in great numbers. May he have glided into Heaven to the heavenly sound of Angels as he did on that magical day in June, 1963. 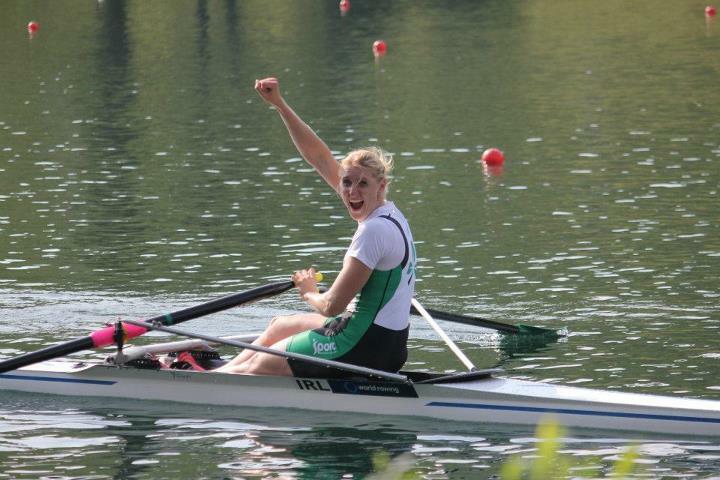 The committee of the Rowing Development Fund (RDF) is delighted to support UCDLBC oarswoman Claire Lambe as she travels to compete for Ireland in the lightweight double sculls, in the forthcoming World University Rowing Championships, which will be held in Kazan, Russia in September. Claire, who is going into final year of Mechanical Engineering, is an exceptional talent who shows great promise for the future. 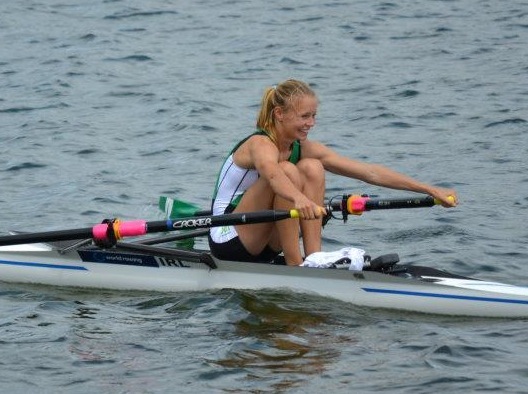 She has competed for Ireland on a number of times, most recently placing 11th in the World Championships , and in July, placing 4th in the World Under 23 Championships (see above). We wish here all the very best, and will keep this site updated with news of her competition. If you would like to contribute to the RDF to support the rowers of UCD, please send an email to captain@oldcollegians.ie. 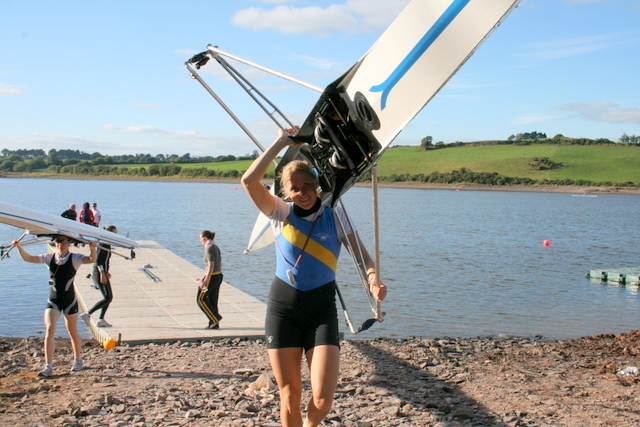 Sanita comfortably won the C final in the Women’s Single Sculls, almost eight seconds ahead of second placed Micheen Thornycroft. This result places Sanita 13th overall in the event. This was a a great performance to end her London Olympics – we are all very proud of her, and wish her and her family the very best for the rest of the summer. We look forward to seeing Sanita build on this performance over the coming months and years as she competes again on international waters! Sanita won her C/D semi final very comfortably this morning, coming in a clear 10 seconds ahead of the next sculler, Da Costa of Brazil. 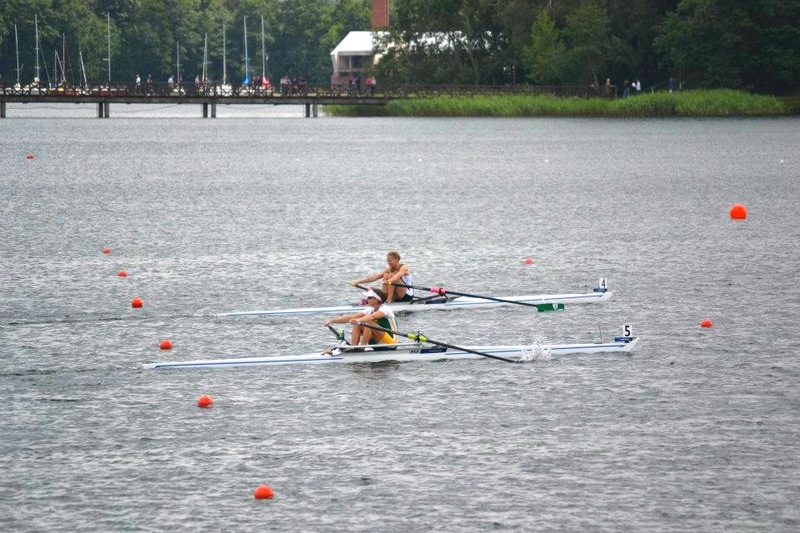 This means that she will race in the C final, in which scullers compete for the 13th-18th positions in the competition. Looking at the times of the A/B semi finals also rowed this morning, it’s clear that on times alone, she ranks somewhere in the top 10. However as noted below, her Quarter Final was a particularly strong field, and as a result she didn’t make her way into the B final, which would have been for places 7th-12th. We wish her the very best for the C Final. Sanita put in a fine performance, narrowly missing out on progressing to the Olympic Semis. The first 3 home in the Quarter would go through with the Swedish and Czech scullers widely fancied to top the race having been World Champions in 2010 and 2011. Sanita had been beaten by the American Sculler in the field earlier in the season and it was reckoned that the final qualification place would be between them, with Sanita needing to reverse the previous result. Sanita had a fast start and was leading for quite a while, with the American back in 5th. The Czech sculler came through to win the race as expected but it was the US athlete who put in the best performance on the day, coming through to take 2nd at the expense of the Swedish sculler with Sanita in 4th by about 4 seconds, just missing out. She gave it absolutely everything and it is telling that her time would have placed her 3rd in all 3 of the other Quarter Finals thereby quailfying her for the Semifinals (In fact she was 8 and 16 seconds faster than the 3rd place athletes in two of the other Quarters). When Sanita looks back at the calibre of those drawn in her race and the times posted compared to the other races I am sure she will realise how well she acquitted herself. She did herself and us proud and hopefully she will have a real go at the C Final in which she would appear to be the stand-out athlete. Sanita placed third in her heat, comfortably qualifying for the quarter finals, which will take place on Tuesday 31st. Sanita’s heat is at 1330 hrs GMT on Saturday 28th of July. Results will be posted here in due course. Born in Riga in Lativa, Sanita and her husband Kaspar came to Ireland in 2006, when Kaspar took up work as a technician with CR Technics in Dublin Airport. Sanita had already excelled as a oarswoman in Latvia, among other things winning a bronze medal in the single scull event in the U23 World Championships. 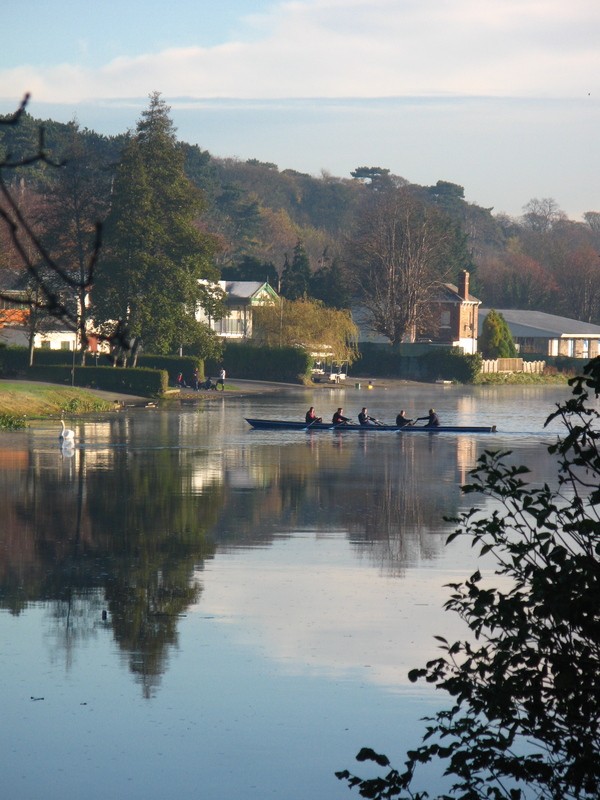 As readers may be aware, since its formation in 1936, aside from it’s status as an alumni club, it has been a core aim of Old Collegians to support the growth of rowing at all levels in Ireland. So we were delighted to welcome Sanita to Old Collegians, which at the time was home to a group of elite women scullers who were competing at the highest level, nationally and internationally. Under Phil O’Keeffe’s guidance as coach, Sanita went on to win multiple national championships in both single and double sculls, as well as winning in 2x and 4x in Henley. These years also saw Sanita and Kaspar settle down and make Ireland their home. 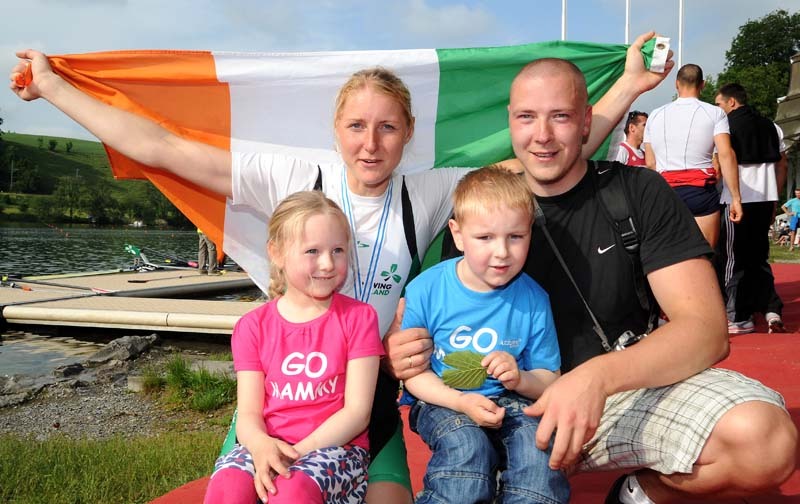 Sanita’s application for Irish citizenship was approved and with their two lovely children, Patrick (5) and Daniela (4), they moved to Iniscarra in Cork to be near the National Rowing Centre. Sanita and Kaspar have sacrificed a lot to reach this moment, and Kaspar has effectively put his career on hold, to prioritise Sanita’s training regieme. In this final few weeks running into the event, they could really do with our help. While Sanita’s needs as an athlete are being taken care of by the Rowing Union, we can significantly help Sanita to focus on her performance by supporting her family in time running up to her competing. On behalf of Old Collegians, could I ask that you consider giving what you can to Sanita and her family, and could as ask that you do this as soon as possible, as we are keen to get funds to them as soon as we can. Needless to say, every cent we get will be passed on. If you would like to make bank transfer, please email Barry Smith the Treasurer at treasurer (at) oldcollegians.ie , and he’ll inform you of account details. Yesterday, in a tightly fought race, Sanita Puspure placed fourth in the World Cup regatta in Lucerne, thereby securing a place in the Olympics. 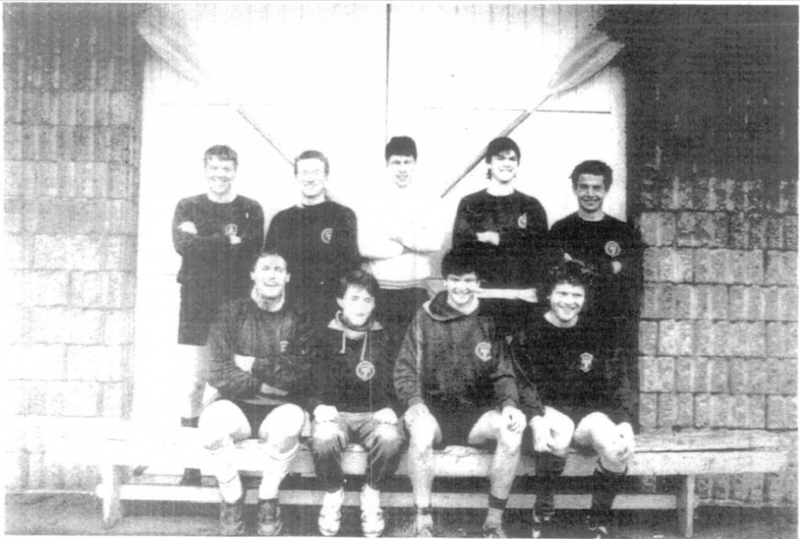 UCD’s 1987 Gannon Cup had a recent rematch with the ’87 Trinity crew, at Trinity Regatta, when both crews competed in the Arthur Ball. Below is a photo of the crew taken before the race, and below again, a scan of the crew photo from the 1987 programme. Allen Higgins filmed this with a camera he mounted on his rigger.